Since the announcement of official support for Kotlin on Android at Google I/O 2017, the use of Kotlin has massively accelerated within the Android community. 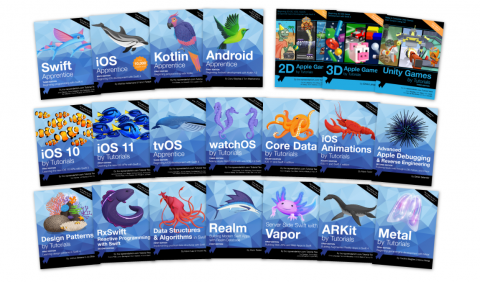 Familiarity: If you’re coming from a compiled language like Java, Swift or C#, you’ll find Kotlin very easy to learn — and you might already be familiar with it if you’re an Android developer. 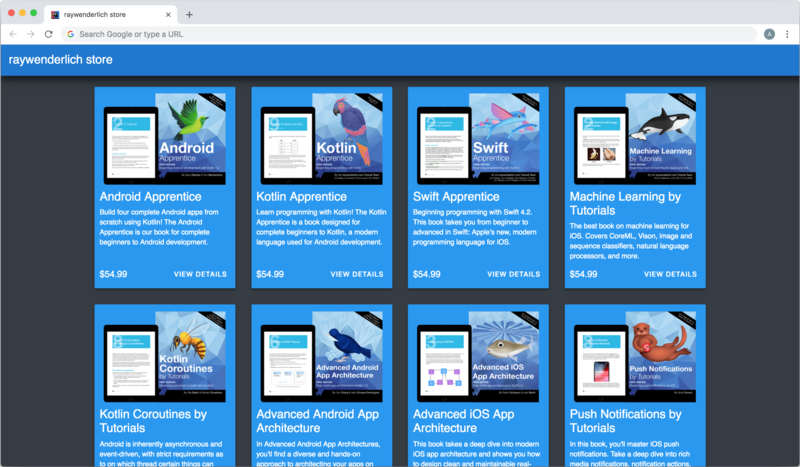 Sharing code between platforms: With Kotlin Multiplatform Projects, you can write the business logic of your app once, and share it across many platforms including your back-end, browser front-end, Android and iOS clients. Prerequisites: For this tutorial, you need a basic knowledge of web programming and a familiarity with Kotlin and IntelliJ IDEA. 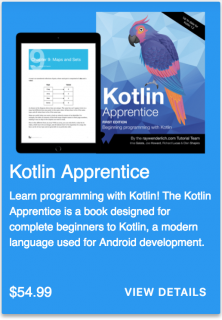 If you’re completely new to Kotlin, you might want to check out the Kotlin Apprentice book or the Programming in Kotlin video course first. 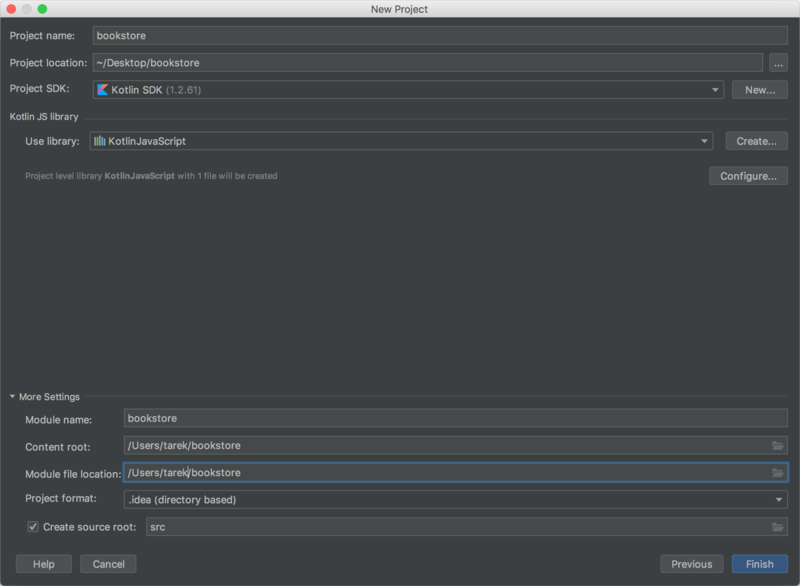 To follow along with this tutorial, you’ll need to use IntelliJ IDEA 2018.2.7 or later (the free Community Edition is good enough), and Kotlin 1.2.61 or later. Start by downloading the materials for this tutorial using the Download Materials button at the top or bottom of this page. Then fire up IntelliJ IDEA and create a new project. 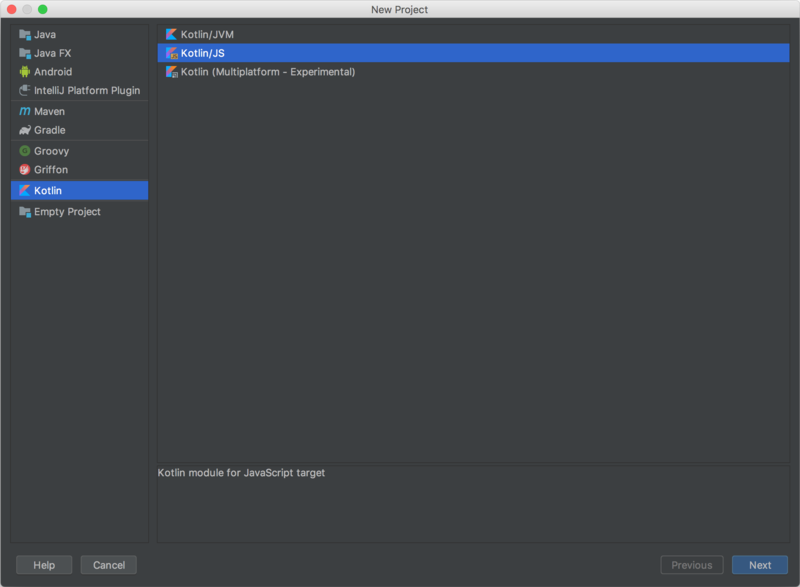 In the New Project window, select Kotlin from the left side panel and Kotlin/JS on the right. Then, click Next. For the project name, use bookstore. Select a project location, or use the default. Then click Finish. Note: The app’s main() function can be in any Kotlin file with any name, so using Main.kt as the filename here is not strictly required, but you should only have one main() function in your project. Note: Both files are already referenced for you within script tags in the starter index.html file, but you may need to check their paths in case you entered a different project name than bookstore. Note: Every time you change your Kotlin code, you’ll need to build your project and then refresh the HTML page to see the changes. Add the following line of code to the Main.kt file, outside of the main() function. Here, you pass the string "getApiUrl()" to the js() function. Since the getApiUrl() function always returns a string, you can cast it safely to a Kotlin String, and store it in a Kotlin value. Now, update the main() function to print the value of the API_URL property instead of “Hello world!”. Now, you have the URL saved in the API_URL value, which you’ll use later. Finally, clear the main() function’s body to get ready for what comes next. Every book has a title, price, description, a URL for its details page on raywenderlich.com, and a cover image URL. You’ll use a basic MVP architecture in this app. A presenter class will contain all of the business logic, while a page class will act as the view. Before you create these classes, you’ll create the contract between them. Show a list of books provided to it. Show a loading indicator while the app is fetching the book data from the server. Display results on any view that it’s provided. Start loading the book data from the data source. In this case, that’s a remote server. This class has a constructor with a BookStoreContract.Presenter parameter. It implements the BookStoreContract.View interface with three required methods (empty, for now). Add a lateinit property to keep a reference to the view. Implement the attach() method from the BookStoreContract.Presenter interface, and initialize the view property with the received parameter. Implement the loadBooks() method required by the BookStoreContract.Presenter interface (empty, for now). You need a way to fetch data from the server. To do this, add the following method to the BookStorePresenter class. Hit option+return on Mac or Alt+Enter on PC to add in an import for the XMLHttpRequest class. Let’s go over what you’re doing here, step-by-step. Create a new method that makes a network request. It takes a URL to fetch from, as well as a function with a String parameter, which it will pass the result of the network call to. Create a new XMLHttpRequest instance. Set this request up so that it sends an HTTP GET to the given URL. Set a callback which will be invoked when the request completes. Check if the request is in a done (4) state, and if it has an OK (200) status code. Call the callback function received as a parameter, and pass it the contents of the network response as a single string. Invoke send() to fire off the HTTP request you’ve set up. Ask the view to show a loading indicator before you start loading the data. Make the asynchronous request to get the books’ data. Parse the JSON response received as an array of instances of the Book data class. Ask the view to hide the loading indicator, since you’ve finished loading and parsing. Ask the view to show the list of books. 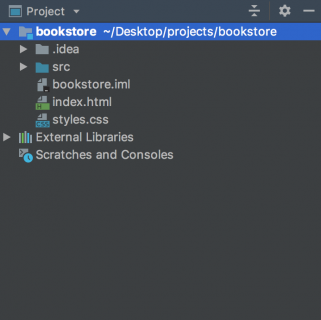 Here, you create a new instance of BookStorePresenter, and then an instance of BookStorePage, passing the page the presenter instance via its constructor. You then attach the page to the presenter and call loadBooks() on the presenter directly. When done with testing, remove the forEach loop with the print statement inside loadBooks(). This means you’ll be able to read its properties, but any methods you’d expect the class to have will be missing – including the auto-generated toString() implementation. If you need a more robust parsing solution that will do this correctly, you can take a look at the kotlinx.serialization library. The index.html file contains two <div> tags with IDs, namely "loader" and "content". The former is a loading indicator that you can show while your app is loading data, and hide when it’s done loading. The latter one is a container that all of the book cards will be added to. To access these DOM elements in your Kotlin code, add two new properties to the BookStorePage class as shown below. The getElementById() method returns a generic Element, which you can cast to the more specific element type if you need (similar to how the findViewById() method used to work on Android). Again, you use the usual DOM APIs to change the visibility property of the elements to either "visible" or "hidden", as required. The loader element is visible by default, so you should see it when you open the index.html page. You’ve updated the main function to directly call hideLoader() to hide the spinner that was visible before. 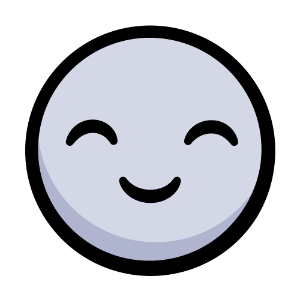 Build the project and refresh index.html in your browser. The loader should now be gone! Create new elements by using the createElement() browser API, passing in the name of the HTML tag to create. For example, use "div" to create an HTMLDivElement and "img" to create an HTMLImageElement. Bind the book data to the HTML elements you created. You will implement this bind() method soon. Apply some CSS classes to the HTML elements you created. You will also implement the applyStyle() method below. Append all of the individual HTML elements to one container. Return the container, which is the root element of the card. Write an extension function that enables you to append a variable number of children to an element, instead of having to call the regular appendChild() method many times. To populate the elements with data, add the following method to the CardBuilder class. Set the book cover image URL as the source of the image element on the card. Set the text content for the various text elements. Add a click event listener to the button element, which will navigate to the book’s URL if the button is clicked. The other method still missing is applyStyle(), which you should also add to the CardBuilder class. This method adds the proper CSS classes that you need to style the book card with a material design style. You can find these classes already set up in the styles.css file. For example, the card-shadow CSS class gives a material shadow to the card container, and the float-left CSS class aligns the element to the left. Let’s go back to the BookStorePage class and start using this card creation code. First, add a property to the class, which will store an instance of CardBuilder. This code iterates through the list of books, and for each book, builds an HTML element representing it. Then, it adds the element to the content <div> we looked up from the DOM earlier. This code sets the current BookStorePage instance as the presenter’s view so that it can receive callbacks from it, and then it asks the presenter to start loading the books. Build the project and refresh index.html. You should see the loader briefly before the app finishes loading the books. Then the book cards will appear. The cards should have a shadow when you hover over them, and the View Details button should navigate you to the appropriate page for the book. You can download the files for the completed project (as well as the starter project) by clicking on the Download Materials button at the top or bottom of the tutorial. 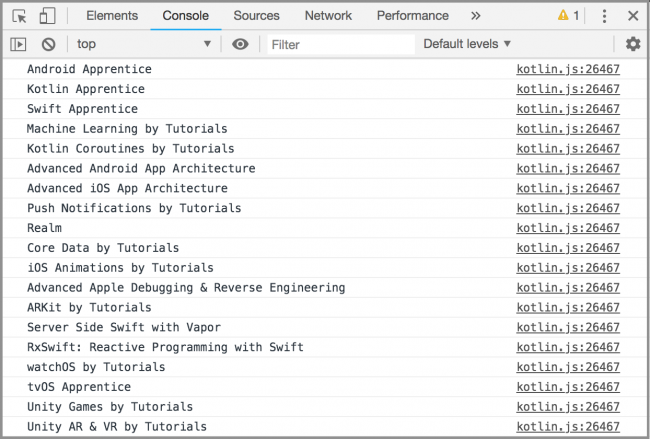 We’ve covered the basics of using Kotlin.js to build web apps with Kotlin in the browser, but there’s a lot more to discover on this topic.